Winter is coming and to survive the oncoming blizzard of data, IT organizations are turning to the cloud for data storage. While we continuously improve our understanding of the cloud's inner-workings, we still need to improve data recovery, considering that data breaches are on the rise and current cloud-based data recovery strategies are leaving a lot to be desired. 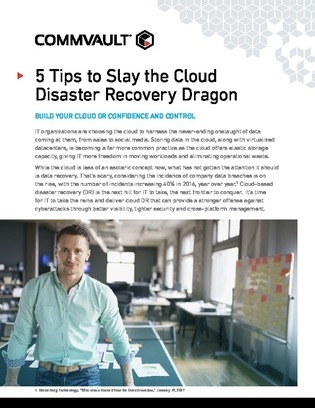 Cloud-based DR may look like a monstrous dragon to some, but this white paper offers five control tips to a more fully enveloped cloud DR strategy to help slay the beast. Read on here.